Splashpoint is a traditional fishermen’s cottage with a sea view Sheringham. It is situated on a quiet no through road with no passing traffic. 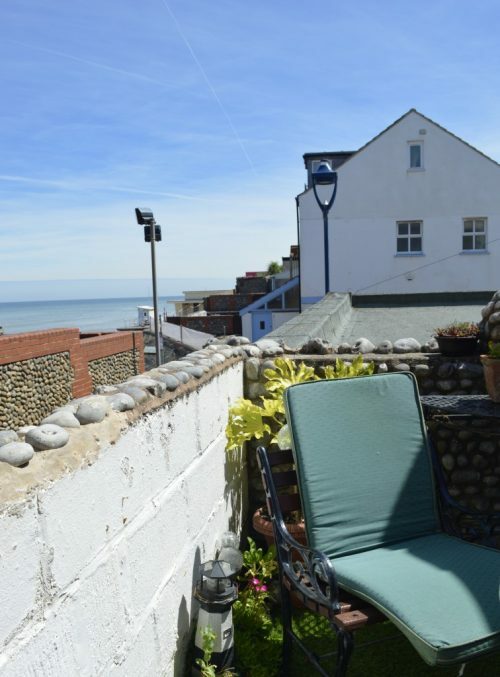 just 20 yards from the seafront. It is one of the best equipped holiday cottages we have seen, right down to beach toys and picnic basket. The star of the show though is the sea views both from the bedroom and the pretty little terrace area, a perfect place to have a sun downer or an al fresco meal. It is a real sun trap. Thank you for a lovely stay, we wanted for nothing and are going to miss waking up to the sound of the sea tomorrow! We will recommend to family and I am sure will return. The children loved being so close to the beach. Front small patio area – a real sun trap in the mornings. Sitting Room – Such a comfortable room to lounge in! Two sofas, one that reclines both ends. Two chairs. Coffee tables and lamps, Large TV, electric fire. Dining Room – A really useful room with a second TV to prevent arguments. Pretty table and chairs, small sofa. Bookcase full of books and games. Kitchen – Superbly equipped kitchen with just about everything you could imagine. Gas hob, gas double oven, microwave, toaster, water filter jug, dishwasher, washing machine. Plenty of crockery and saucepans. Shower room – Large shower, basin and separate toilet. Window with sea views. Bedroom 1 – Double bed, wardrobe, dressing table,bedside tables and lamps, window seat with sea views. Binoculars to spot shipping and wildlife. You can lie in bed here and listen (and see) to the sea. Bedroom 2 – Double bed and further single bed. Plenty of storage, wardrobes and chests drawers. Cot available. Outside – Houses with sea views in Norfolk are quite rare so this is a wonderful little spot. The owners have made a super little terrace with comfortable chairs and a table so you can really get the most from the view. It is a real sun trap and pretty private. There are also a couple more chairs on the pathway to the rear door. You have a gate here the leads directly to Lifeboat Plain, and then onto the beach. Just a few steps. There is no parking with the house but there is an informal arrangement with the pub to park in their car park. The owners will give you details of this before arrival. Otherwise there is a pay car park close by and you can buy a weekly ticket for this. Sheringham is famous for its wonderful beach and being the main station for the North Norfolk Steam Railway, know as the Poppy Line.which in September becomes the focus for the equally famous 1940s weekend which is attended by thousands of people every year. The railway hosts many events over the year which are always worth visiting.